A new law went into effect January 1, 2019, in Colorado changing the type of parking placard required for exemption from paying at metered parking due to disability and to ensure enforcement of this exemption across the entire state. House Bill 18-1285 Remuneration-Exempt Disability Parking Placard, also called the Chris Hinds Act, was introduced by Craig grad Chris Hinds when he learned that the laws he thought protected him from being required to pay at parking devices were not being enforced statewide. 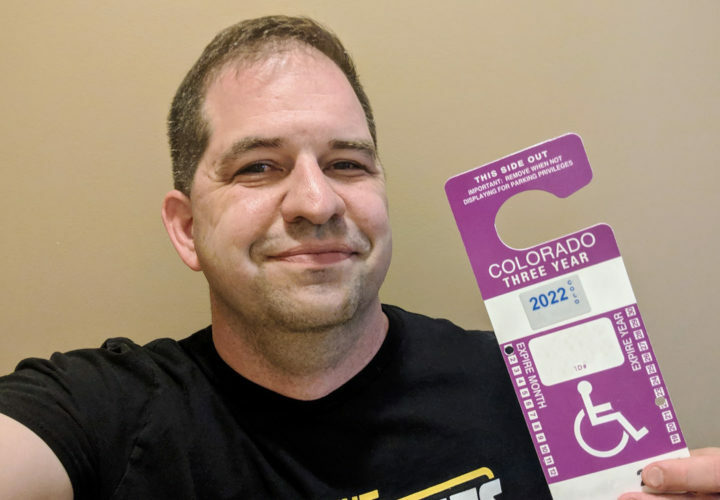 Chris created a bill that was passed last May by the Colorado General Assembly to create a new parking placard to specify who is exempt from paying parking device fees and ensure that the new law was applied to all of Colorado. Today, the new placard must be displayed to ensure exemption from paying at metered parking devices, providing the exemption statewide only to those who are unable to access parking devices. Cities in Colorado may still decide whether to provide free parking for the current red and blue placards, but only the new purple placard ensures free parking statewide. Learn more about the new placard and how to apply through the DMV.